The discriminator IC in the Uniden Bearcat 100XLT and 200XLT is a TK10421. Pin 11 contains the unfiltered audio. 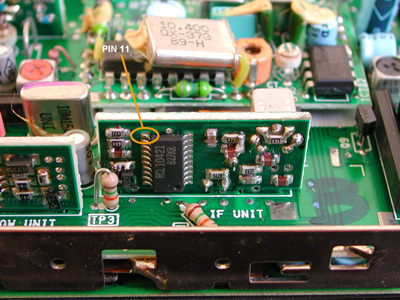 This IC can be found on a vertically mounted PCB, called 'IF Unit'. Test point 3 (TP3) contains a signal coming rather straight from the discriminator, but it is filtered too much to be of use. 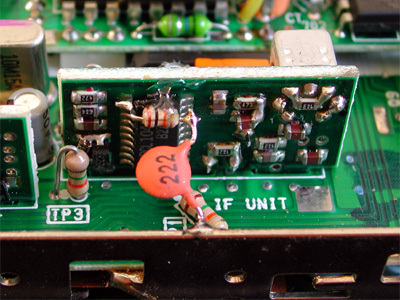 A limiter resistor of 10k is fixated to the IC with a drop of glue from a glue gun. As the discriminator output contains a slight IF component, a simple RC-filter is created by adding a 2.2 n capacitor. The cutoff frequency of this filter is about 7 kHz. 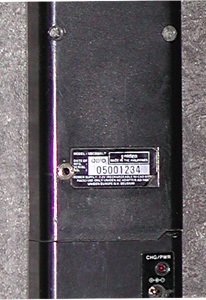 The capacitor is connected to the metal frame of the scanner. The core of a small piece of shielded cable is connected to the junction of the resistor and the capacitor. The braid is connected to the scanner's metal frame. 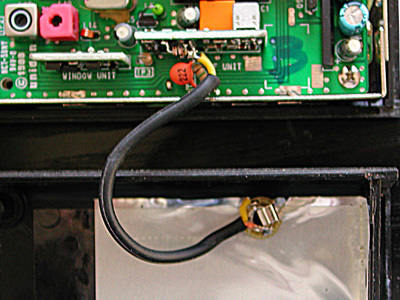 The other side of the cable is connected to a 3.5 mm chassis terminal in the back of the scanner.